The National Association of Nigerian Traders (NANTS) Monday petitioned President Muhammadu Buhari and the Economic Community of West African States (ECOWAS) over the alleged closure of over 400 businesses owned by Nigerians in Ghana. 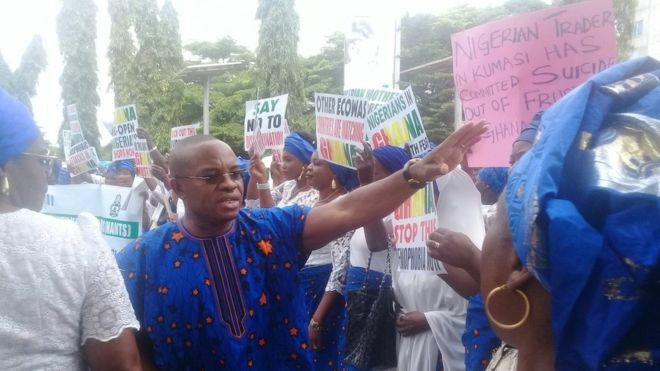 In a protest march to the ECOWAS secretariat, the placard-wielding traders urged the commission to intervene to stop the alleged victimisation of Nigerian businessmen and women in Ghana. With inscriptions including, “Ghana re-open Nigeria’s shops now”, “The situation in Ghana is totally unacceptable”, “ECOWAS, Ghana wants AFCTA secretariat but clamps on African traders”, the group also urged President Buhari to wade into the controversy to save Nigerians. He said ECOWAS President Jean-Claude Brou had also been petitioned over the development. He said: “This is a save-our-soul call and urgency of this protest is to inform you of the state of fear, uncertainty and insecurity that Nigerian traders are currently subjected to in the hands of the government and people of Ghana in different cities under the coordination of Ghana Investment Promotion Centre and Ministry of Trade and Industry. According to him, “In August 2018, the Ministry of Trade and Industry, GIPC and Ghana Union of Traders Association in a joint operation established a task force with specific mandate to clamp down on Nigerian traders and which had eventually resulted in the ongoing closure of over 400 Nigerian traders’ shops and lawfully established businesses in Kumasi, Ashanti region of Ghana.